You’ve probably found us because you or a loved one has been bitten or attacked by a dog. When people are injured in dog bite attacks, the natural thought process is to wonder about your legal rights and options. You’re doing the right thing by doing your research. You’ll find the answers to your questions here. Given the high number of California dog bite attacks, there are California laws in place that deal with these situations. According to the Office of Statewide Health Planning and Development, more than 38,000 people reported to emergency rooms in California because of dog bites in 2015 alone. That number has been trending steadily upward for several years. Below you’ll find an overview of California dog bite laws so that you can add some context to your troubling situation. The defendant owned the dog that allegedly bit the plaintiff. The dog bit the plaintiff when the plaintiff was in a public place or lawfully on private property. The defendant’s dog was a substantial factor in causing that harm. If the person who has been injured in a dog bite case proves all of those elements, it’s possible that he or she will recover monetary damages. The dog bite victim was trespassing at the time of the attack. The dog bite attack victim provoked the dog. The person was injured by his or her employer’s dog while on the job. The victim was performing a paid service when he or she was injured. Every California dog bite attack situation is different. As such, different norms and standards may apply to a particular situation, and different exceptions could as well. Those interested in reviewing the entire strict liability statute regarding California dog bites can find it here. Potentially dangerous – A dog can be classified as potentially dangerous if it has attacked a person or another animal twice within a three-year period or it’s bitten someone once and caused minor injuries. A link to the full statute can be found here. Vicious – If a dog has ever severely injured or killed someone even once or attacked another animal or person more than twice during the previous three years, that dog may be classified as vicious. A link to the specific statute can be found here. These classifications could be relevant in one of two ways. First, if you are injured by a dog that is classified as either potentially dangerous or vicious and the owner did not take the precautions required by law, it could lead to criminal charges against that dog owner. Secondly, if you are injured by a potentially dangerous or vicious dog, it could lead to remedies brought by local animal control authorities against the dog. With regard to a civil case claim, if an owner was aware of the dog’s potentially dangerous or vicious nature and chose not to do anything about it to keep others safe then it could pose stronger liability against the owner. Negligence – A dog keeper or owner can also be held liable dog bite injuries if the keeper or owner is careless in the handling of the dog at-the-time of the dog attack. If the person attacked and injured by the dog can show that the handler or owner was not reasonably careful in controlling or handling the dog and that their injuries were the result of the keeper or owner’s unreasonable care. A negligence cause of action doesn’t require proving vicious tendencies of the dog. The most important and key factor is the owner or keeper’s unsuccessful control of their dog. ***Even dogs that appear to normally be mild or calm can be dangerous depending on the circumstances. Case in point, if a keeper or owner does not have a leash on their pet in a public like a park and the dog jumps on someone and injures them, the keeper or owner would be negligent under the law. Negligence Per Se – Under the law, “Negligence per se” means that a keeper or owner is consequentially assumed to be responsible for injuries of a dog bite attack victim, if a local animal control law or “leash law,” isn’t followed and the violation is the cause of the dog bite attack injuries. If the dog keeper or owner can’t justify not following the law, then they are responsible and there is no need to prove that the keeper or owner was negligent in their control of the dog. Common Law Liability – The key factor in determining common law liability is predicated on the knowledge of the dog owner regarding the dangerousness of the animal. To prove this form of liability, prior vicious behavior or bites by the dog must be shown and the keeper or owner must have known about it. The “one-free-bite rule”, that is the law in many states, is similar to common law liability. California’s law has basically replaced this common law action as applied to dog owners, but common law is very useful if the facts of the case fit the knowledge of the dog owner regarding the dangerousness of the dog. The trespassing defense claims that the victim was trespassing or not lawfully on the dog owner’s private property, which removes liability under the strict liability, if true. California’s strict liability law only applies if the victim is lawfully in a private place at the time of the attack or in a public place. Although under California dog bite law an injury must be caused by the action of a dog bite, the skin does not have to be broken. Case in point, a dog owner is still liable if the attack victim is bruised or suffered nerve damage even without puncture wounds. Where non-bite injuries occur after a dog jumps on or knocks over someone, the dog owner isn’t responsible under strict liability, but may be responsible by other dog bite law theories of recovery, such as negligence (discussed above). What happened prior to an attack is significant in determining whether a dog owner will be held liable. A dog owner may not liable if the attack victim provoked the animal. The important facts are whether the person was bitten or attacked had the requisite knowledge and appreciation of the danger and a voluntary acceptance of the risk of being bitten by the dog and chose to act in a way that provoked the dog anyway. ***The assumption of risk defense also come into play when someone assumes control or possession of the dog, i.e. trainers, kennel staff, house sitters, groomers, handlers, veterinarians and their support staff assume the risk of being bitten while treating a dog in their possession and control. No one wants to see people injured in dog bite attacks. We are a culture that loves dogs, who are affectionally known as “man’s best friend.” Unfortunately, these situations do arise, and as a result, more than 100 people in California go to the hospital every day for dog bite attacks. If you or someone you love has been harmed in this type of attack, you need to take action to protect your legal rights and options (including scarring remediation, plastic surgery and surgical repair of muscle tears, ligaments, and tendons). Doing so will not only help you recover from your losses, but it could also prevent others from being seriously injured or even killed in the future. 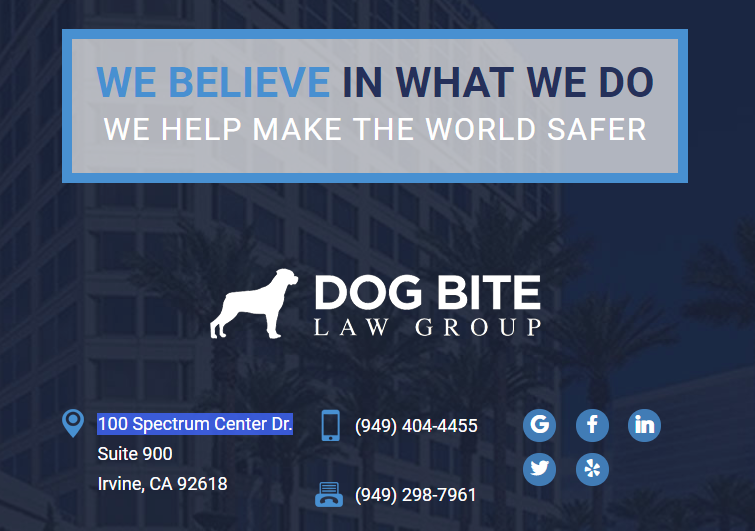 If you’re unsure how you should proceed, you can start by seeking the help of experienced Orange County Dog Bite Lawyer who has been standing up for the rights of those wrongfully injured for years. Contact the Dog Bite Law Group today to schedule a free initial consultation.